The raw food diet doesn't allow food to be heated over 42C as higher temperatures are being considered to kill the vitality and life force of the food. That's one fact. Now have you ever driven a car without air conditioner when it's 46C degrees outside? I have today, and will have to do so for another few days. Guess how I felt afterwards? Quite cooked, and not very vital, so to speak. My car A/C broke down last weekend, and the spare part to fix it will only arrive after 4 working days, I was told by the workshop. Very bad timing. My garden is almost bare now that summer is here. Tomato and pepper plants have wilted in the heat long ago. Only the herbs are still hanging in there. My rosemary has become almost a bush, and if nothing else would grow in my garden, I will always have a green thumb with basil. Some of my basil plants have grown into shrubs. No summer temperatures can make them wilt. They need to be watered, sure. But other plants just wilt under the sun, no matter how much water they get. My family loves to go and pick fresh basil leaves when they order a pizza, throwing out the pathetic looking dark green basil that's been delivered with the pizza, and replacing it with the fresh ones. I made a big batch of pesto the other day. It can spice up almost everything. I thought it would be a nice change to use pesto instead of dairy-based dressing in a potato salad. To give it a bit more zing I added finely chopped fresh ginger. What a revelation! To me, the addition of ginger makes this salad. Spicy but not fiery, with a little extra crunch from the pine nuts. My new favorite potato salad. Cut the potatoes into 1/2 inch cubes, and steam or boil in lightly salted water until just tender, about 5 minutes. Drain and set aside to cool. In a food processor combine all ingredients for the pesto, except the olive oil. Pulse a few times, then add the olive oil in a thin steady stream while blending. Blend until smooth. Season with salt and pepper to taste. 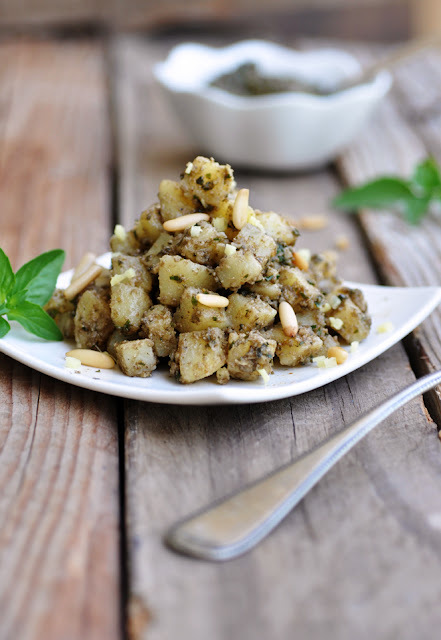 In a serving bowl, combine cooled potatoes and pesto. Stir until well coated. Stir in the the finely chopped ginger (alternatively add it to the pesto before combining with potatoes). Sprinkle with roasted pine nuts. Let sit in an airtight container for 1-2 hours for the flavors to spread. Serve cold or at room temperature.